Do you want the benefit of coaching at a reduced price? Do you have something you want to accomplsih with a partner or small group of friends or associates? Using the approach of the One-on-One Coaching and the principles of the Power Living® Practice as the context, our Group Coaching is entirely customized to your needs. You pull together the group and decide what you want to accomplish. We’ll then set the schedule and agenda. We can cover a variety of personal and business topics for groups of 2 to 15 people. any other combination of topics you can think of that could transform your lives! Form your own business think tank or weight loss team, you set the intention and we’ll guide the program. Depending on what your goals are, you can choose to do just one session or a series of 6, 12 or more. The 90-minute sessions can be done in-person or via teleconference, at the Power Living offices or your own location (travel fee may apply). An additional per-person materials fee may also apply depending on the agenda (i.e. for cooking classes, visioning sessions, etc.). Learn how to support each other through the process. Save hundreds of dollars in coaching fees as you change your lives together. Receive an additional discount if you book 7 to 15 people. In other words, as you pull more people into the circle you lower your own price! Six 90-Minute Sessions – Save $150 per person! Includes one autographed Power Living book (depending on coaching theme). Twelve 90-Minute Sessions – Save $600 per person! 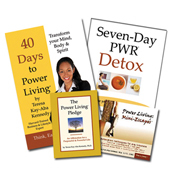 Includes two autographed Power Living books (depending on coaching theme). For more information, read through our Coaching FAQs. If you have any questions, feel free to email coaching@power-living.com or call 212-901-6913. From boosting productivity, managing stress and going green to fine-tuning your communication, personal branding and leadership skills, Dr. Kennedy will be the master guide for your group. Find out more and view a video at www.drterrikennedy.com. To book Dr. Kennedy for a speaking or media event, email info@drterrikennedy.com.